We have been looking at ways we can help a child to get ready for starting school – you can view the starting school series here – and today our focus is on writing their own name. Learning to write their own name is quite a milestone for a child. It is important to understand that no-one will be expecting all children to start school already able to do this – some will be able to, many won’t. All skills are acquired as part of a learning journey. Here are some ideas you can use at home to help your child start to develop this skill. 1. Let them see their name. Having their name around the house is a great first step in introducing the letters to your child. Every time they draw a picture, write their name on it. Always write their name correctly – with a first capital letter and the other letters in lowercase. Sure, at home they’re not in a class of other children so you don’t need to label their masterpiece to stop it getting mixed up with other children’s, but adding a name label demonstrates to them how to hold the pencil, how the letters go from left to right, how each character is formed. You can also add a name label above the peg where they hang their coat and make a nameplate to stick on their bedroom door. As they see their name popping up around the house they’ll be starting to memorise the shape and sequence of the letters. 2. Make marks everywhere. Developing writing doesn’t have to be done with a pencil on a piece of paper. Young children benefit from making marks and starting to write letters on a large scale so begin by tracing letters in the air using broad arm movements. 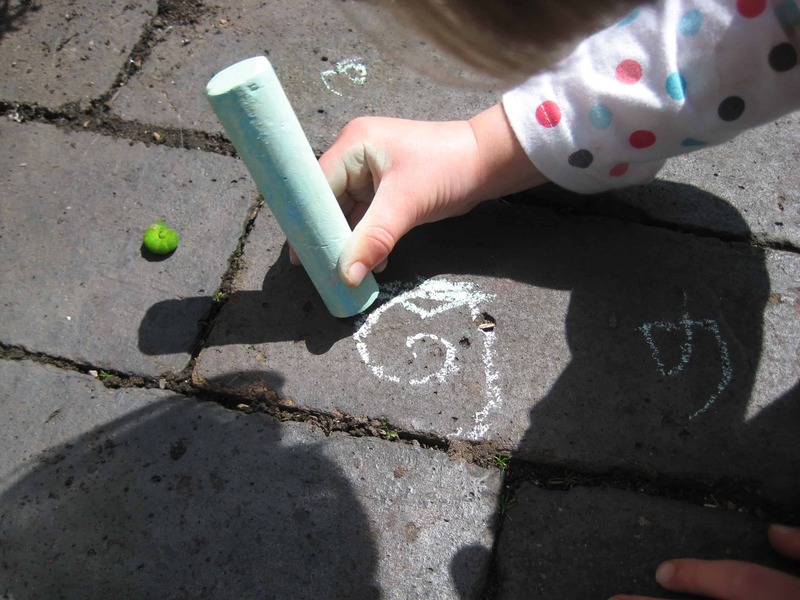 Make marks whenever you can, using fingers, sticks and paintbrushes, with sand, play dough and paint. 3. Provide a vertical writing surface such as a blackboard or paper on an easel. Writing on a vertical surface is a good way to naturally position the pencil and wrist in a writing position. 4. Give fingers a workout. You can develop dexterity and strengthen fingers which are soon going to be holding a pencil by playing with play dough or baking bread. This kind of play builds up finger strength and grip, ready for scribing. 5. Hunt out letters. Starting with your child’s initial you can go on a letter hunt – out and about in your neighbourhood like on our letter walk, or by searching through newspapers and magazines, as in this idea from No Time For Flashcards. Most importantly, remember to have fun with writing. Encourage children to feel proud about trying, without being overly concerned at this stage about perfectly formed letters. I never thought to write my child’s name on his artwork at home. What a great idea! I’m going to start today. Thank you for sharing this post with me on KBN. I featured it in my letter learning post today! Ps. I think it’s funny to see my comment on this post from almost two years ago. I did start writing his name on EVERYTHING that day… and now he can write it himself. Thanks for the tip! Jackie – that’s great! Thanks for the feature and I’m so glad the idea worked for you. Hi Hunter. Glad you find the site useful. Good luck with your studies.